Search engine optimization is the process of improving your website and relevancy for searches performed in search engines. Most of us are familiar with the concept of SEO. A big part of an effective SEO strategy is understanding the difference in branded and non-branded search queries, how to influence them, and why each is important. We’ll take a dive into the world of search and uncover some opportunities for maximizing your reach. Branded search is when someone does a search that includes your brand name like “Nike shoes” or “Your Pie locations” or “SEOteric marketing”. You can think of this as someone that knows what they want and who they want it from. Non-branded search is when people look for a product or service that doesn’t include a specific brand. They may have an idea of what they want, but are not sure of where to get it or who to get it from. These searches are usually earlier in the buying process of searching for the right solution from the right source. Examples of non-branded search might be “running shoes”, “pizza near me”, or “marketing agency in Georgia”. All of these are searches where the user has an idea of what they want, and are looking for options. Close to half of all searches in Google have a local intent, and many of those trigger local business listings and local results. Local results in Google My Business breaks searches down into “Direct” (branded) and “Discovery” (non-branded). This is a great way to look at it. Branded search is someone going directly to your business. Non-branded search is people discovering your brand through keyword search. Branded search is important for conversions and higher click through rates from an audience coming to you directly. This is usually people that have heard of you before, like fans, employees, customers, and interest drawn from other marketing channels. It also can be people doing “due diligence” on you by checking reviews, looking at reputation, or looking for credibility/reassurance in your business. These factors impact conversion rates because there is already some knowledge of the brand, and if what they find in their search strengthens your credibility, then a conversion is likely. If reviews or reputation becomes a red flag, it will hinder conversions. Branded search can have a positive impact on click through rates from search for both organic and pay per click searches. CTR is a metric used in paid search to calculate quality scores, so having good click through rates can help paid advertising budgets squeeze more out of campaigns. 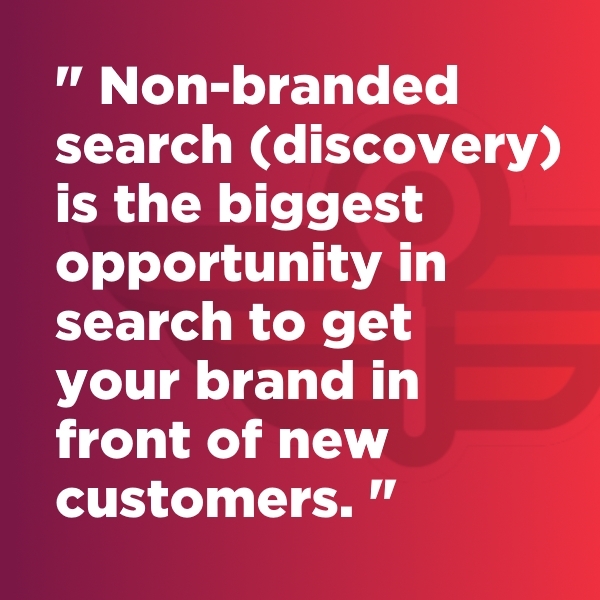 Non-branded search (discovery) is the biggest opportunity in search to get your brand in front of new customers. People looking for a product or service in non-branded search may not have made up their mind on a solution yet. You get to introduce your brand to them as a search result or local result. There is *typically* more search volume in non-branded (discovery) searches than branded searches, meaning more people are searching for answers than have the answers. Some brands have become popular enough that their branded search has overcome the volume of non-branded search. Take Dropbox for instance. Using their growth hacking model, “Dropbox” has over 2 million monthly searches on average in Google. “File sharing” has just under 10,000 monthly searches, and “online storage” has about 5,500 monthly searches on average. So there are some instances where a brand becomes synonymous with the solution, and thus drives more search that people looking for the product or service they offer. 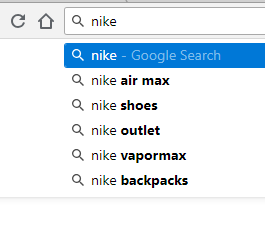 The non-branded search is a small portion of the branded search. Sometimes non-branded search results trigger branded search for further discovery. For example, if I’m looking for “running shoes” and I see Brooks and Saucony rated as high or higher that Adidas or Nike, my next search may be a branded search like “Saucony running shoes”. In this instance, it took exposure in non-branded search and a strong branded search to create the potential for conversion. For businesses looking to grow, non-branded search strategies in SEO is the way to go. Take the example from Your Pie. When we started in January 2017, there were 37,000 total impressions per month in Google, with 30,000 of those being branded search. Fast forward to June 2017, and for the first time, there were more impressions for “pizza near me” than there were for “Your Pie”. As of November 2017, non branded search had far overtaken branded search, and more and more people are discovering the brand, leading to more in-store visits. By June 2018, the non-branded search exposure is continuing to grow, and creating even more discovery opportunities, with close to 100K impressions for “pizza near me”. How Difficult is it to Influence Branded and Non-Branded Search? Considering that it has long been held that there are more than 200 ranking factors, and recently it has been discussed that there are likely many many more than that. That means influencing rankings is difficult. Difficulty can vary greatly though based on the keywords and the competition for those terms. Let’s look at “online storage” from the Dropbox example. This is a highly competitive keyword, with a “Hard” rating. Getting ranked here would be quite difficult. The difficulty is measured by the strength of the competition in the search results. The websites listed here would be tough to catch. This is a national keyword with national competition. For local businesses, the difficulty isn’t as high. What if you are a body shop in Yuma Arizona? The keyword difficulty is about 20% (20 out of 100), and the competitors in the space aren’t near as strong. Depending on your SEO targets, the path to success can vary greatly in time, energy and budget. The first step is to earn rankings for your brand name. You’ll need to focus on making your website relevant with strong brand signals. Get your name, address, and phone number published prominently. Leverage Schema.org markup (there are free schema generators available). Tag your logo alt text with your brand name. Include it in your title tags. Link your social profiles to your website and build them out fully. Include as many platforms as possible like Facebook, Linkedin, Yelp, Twitter, Instagram, etc. Get your business in the Google Knowledge Panel and in Google My Business. Once you have your listing verified, influence search with it locally. Earn links pointing to your website using your brand name as the anchor text. Get your business listed on the major local websites like yelp, yellowpages.com, etc. The more citations you can get from reputable sources, the better. Leverage “co-occurrence” which is a brand association signal where your brand is found in close proximity to a keyword, or linked along with or beside key phrases. Example: “find running shoes at nike.com” or “website designed by SEOteric”. Leveraging co-occurrence can help you earning auto-complete or related searches that include your brand. Your website content can go a long way to influencing this as well if you have pages related to your products and services that include your brand. If enough people search for your brand (and you’ve influenced it enough via content, links, and co-occurrence), you can attract more branded search by your products and services. If you take the Dropbox approach to growth hacking, you can create Demand Generation using social media or traditional advertising, or buy providing a free or low cost service. Dropbox would also give away more free storage if you referred someone to them that signed up. As their user base and demand grew, so did their branded search. Traditional media can also influence branded search. If people see a message or hear a message, they may be more inclined to Google the brand and the service. Brand search influences click through rate and conversions as mentioned above. Getting ranked in Google boils down to a few major factors that have many sub-factors. If you handle the big picture factors, a lot of the sub-factors tend to take shape. Here is a high level view of what it takes to influence and improve rankings for non-branded search keywords. You’ve got to be a good resource for the query. That starts with content. If you plan on winning traffic for something like “online storage” or “body shops in Yuma Arizona”, you’ve got to become a valuable resource about that topic. Your website should cover online storage from top to bottom with definitions, comparisons, FAQs, reviews, data, images, illustrations, and everything that helps the user understand it better and make a buying decision. If you are local, that also means having a location near (in proximity to) the searcher. You’ve got to be credible. Credibility is a measure of importance or authority, and links are how authority and credibility flow around the internet. If you’ve got great content, then share it. Promote it. Email it. Introduce it to other bloggers and website. Earn links to it by being a good resource and getting that in front of people. Help users accomplish their tasks. This is known as “search accomplishment” and may play a role in ranking ability or keeping rankings. If users find what they want from your website, then they can get what they want out of the search they did. Accomplishment might be converting on a form, a purchase, or getting info on a subject. In the big picture, if your goal is to help users accomplish their intent, you’ll be a better search result, and start moving up (assuming you are handling 1 and 2 above). Be technically sound. This means your website has taken steps to improve user experience and reduce errors. Think about things like page load speeds, SSL security (using https), structured data (code used by search engines to better understand content), and mobile responsiveness (working well on mobile devices). If you do all of the above, and miss technical issues because of a slow website or it not working well on mobile devices, it will hurt your ability to rank, and to convert visitors into customers. Build social proof. Good reviews and other websites and citations can help users learn more about you when doing branded searches. Manage your social media profiles and business listings and keep them current. Some of the best practices aren’t direct ranking factors, but do influence how users view your brand. Search for your brand name and analyze what you see, then take steps to build that. More on this below. At SEOteric, we still hold that leveraging non-branded search is one of the best ways to increase website traffic, attract new visitors, and introduce your brand to new customers. When you take a holistic approach to improving both branded and non-branded search, you can leverage SEO to increase customers, leads, and revenue. We’ve seen many examples of how powerful ranking for non-branded searches can be, and we continue to develop new ways to influence search to earn traffic from the discovery process.